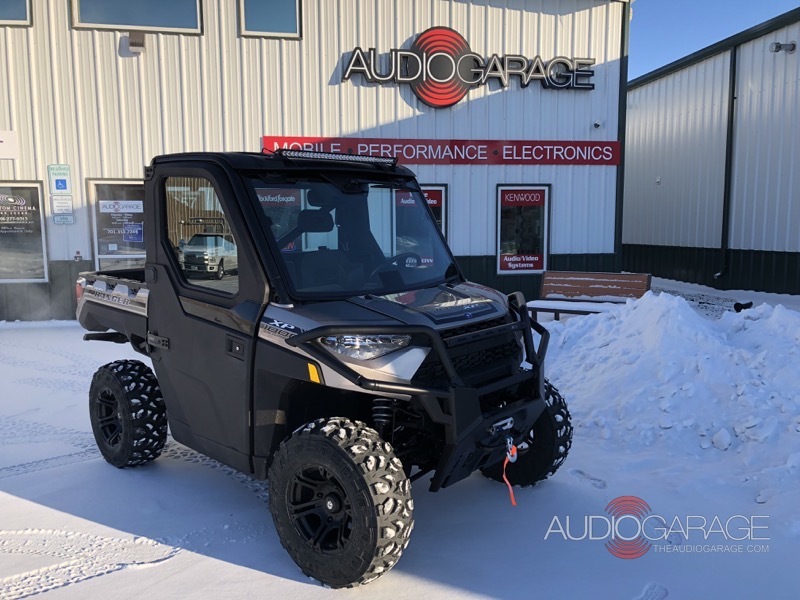 A client from Fargo recently visited The Audio Garage to talk about his 2018 Polaris Ranger audio upgrade. This client buys a new ATV every couple of years and is very knowledgeable about the factory audio systems available from the local dealership. Knowing what he wanted, the client dropped the Ranger off at our store immediately after purchasing it. The radio was mounted at an angle to provide good visibility for the driver. Our fabrication team created a dash-top pod for mounting the new radio. The customer didn’t want the typical Bluetooth streaming products offered from Polaris; he wanted to have AM/FM radio as well. We decided to use the Rockford Fosgate PMX-2 compact digital receiver. This unit features a marine grade rating of IPX6, Bluetooth streaming, USB input and AM/FM/weather band tuner. We built a fiberglass enclosure to to provide a robust mounting point on the dashboard. Our installation staff also made sure that the PMX-2 would be visible from the driving position. Our audio transformation blows away any of the factory systems. The front pockets served as a perfect location for new speakers. 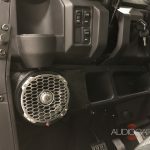 The 2018 Polaris Ranger doesn’t offer front speaker locations. As the client didn’t want speakers mounted on the roof of his side-by-side, we converted two of the factory storage compartments in the dash into speaker enclosures. The factory compartments don’t have covers, so our team created custom panels to seal these compartments and provide a mounting location for the speakers. We fiberglassed and texture matched them with truck bedliner spray. Once the enclosures were finished, we installed a set of Rockford Fosgate PM2652B 6.5-inch marine-grade coaxial speakers to provide the best sound possible. 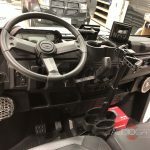 The aftermarket hasn’t caught up with the 2018 side-by-side, so our installers got to work researching and mocking up the Ranger for a subwoofer. We noticed that the RFRNGR-FWE sub box from Rockford Fosgate was close, but we had to be creative to make it fit perfectly. We used a PM210S4B subwoofer that matches perfectly with the enclosure. A Rockford Fosgate TM400X4ad amplifier powers the Ranger’s sound system, providing up to 100 watts of power for the front speakers and 200 watts to the subwoofer. 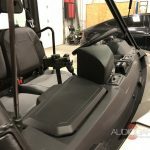 The client was impressed with our attention to detail in making sure all the aftermarket pieces blended perfectly with the factory ATV interior. 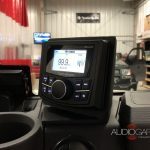 If you are in the Fargo area and are looking for an audio system or lighting upgrades for your side-by-side, drop by The Audio Garage and a member of our professional sales staff will answer any questions you might have. If you are unable to come into our store, please send us an e-mail using the contact page here.